The cardiovascular system is greatly dependent upon nerves, blood vessels, oxygen and blood flow to support heart, and arterial and circulatory health. Increased blood flow is also helpful for eye health, pain relief, general circulation, organ health, athletic endeavors, and certain kinds of headaches. Additionally, cardiovascular health is concerned with plaque buildup in the arteries and the health of the cells lining blood vessels. 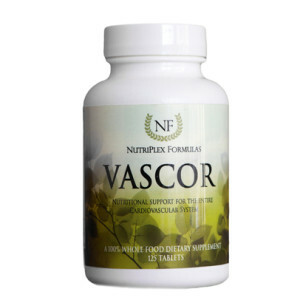 Excellent for cardiovascular system, all organs and structures needed a health blood supply, & much more! In addition to the unique properties, synergists and cofactors of this food, each serving provides the following nutrients contained within the above food-nutrient blend (not as isolates): Vitamin A, Vitamin B, Vitamin C, Vitamin D, Vitamin E, Carotenoids, Calcium, Iron, Zinc, Potassium, Magnesium, Selenium, Phosphorus, Amino Acids, Flavonoids, Pigments, Enzymes, Coenzymes, other phytonutrients and more. 4 tablets daily, or as directed by a healthcare practitioner. Researchers in cardiology have established the importance of potassium, magnesium, calcium, and other minerals and trace minerals for the cardiovascular system. These nutrients support proper relaxation lower inflammation, heartbeat regulation and nerve conduction to the heart and blood vessels. Food compounds contribute to oxygen transport, blood flow and the integrity of veins and arteries. Prices may vary by region. FOR HEALTHCARE PRACTITIONERS: Much more information is contained in our Doctors Support Section. Call us for access. IMPORTANT NOTICE: ©2019 NutriPlex Formulas, Inc. • Statements are made based on independent food science research and have not been evaluated by the FDA. Information contained herein are for educational purposes only and are not to be used for or in place of proper medical diagnosis and care under a qualified physician. Always check with your physician before using any product for contraindications and proper use. What is the best supplement? This may surprise you. Learn how whole foods can help your patients in our monthly email. Enter the Doctors Support Center for exclusive content.